In December, we published a story on "virtually destitute" actor Michael Hawkins, best known for his soap opera work which included being the original Frank Ryan on Ryan's Hope. 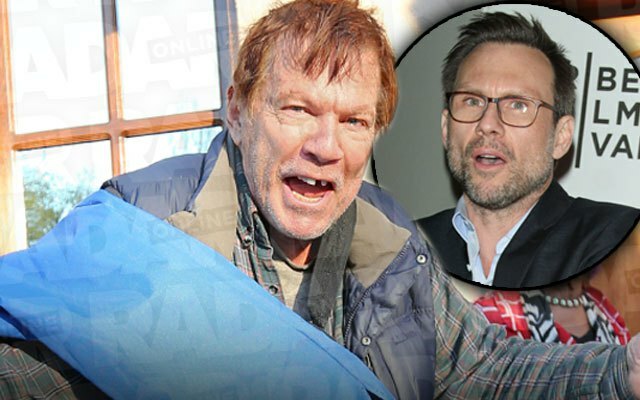 Hawkins has now filed a $20 million lawsuit against his son, Christian Slater, who played roles on Ryan's Hope and All My Children early in his career. Slater's dad, Michael Hawkins, says his son and ex-wife Mary Jo Slater "ruined" his acting career in the suit, according to court papers obtained by People magazine. The suit asks that the court order Slater to pay his father for damages as a result of slander, libel, defamation of character, intentional interference with prospective economic advantage, invasion of privacy, and intentional infliction of emotional distress. Hawkins asked for a jury trial. Hawkins pointed to a December 2015 interview in which Slater said Hawkins is "a manic-depressive schizophrenic." The 80-year-old actor argues that Christian doesn't have the medical degree or knowledge to diagnose mental illnesses. He also says that he has been "blacklisted" in the entertainment industry and doesn't believe he'll ever be able to act professionally again. In a 2015 Interview magazine article, the 46-year-old Slater referred to his father having a mental condition and said it was a cause of his father's acting career problems. He also said they had a "tumultuous, back-and-forth relationship," but they were working on reconciliation. Christian Slater began his career on his dad's former soap, playing D.J. LaSalle on Ryan's Hope in 1985, before joining All My Children as Caleb Thompson. He was almost 6 years old when his father appeared on the first episode of Ryan's Hope. Michael Hawkins' other soap roles included Mark Elliott on Love is a Many Splendored Thing and Paul Stewart on As the World Turns. Mary Jo Slater is a former One Life to Live casting director.